It took them only an instant to cut of that head, but it is unlikely that a hundred years will suffice to reproduce a singular one. It is almost possible to predict one or two days in advance, within a rather broad range of probability, what the weather is going to be; it is even thought that it will not be impossible to publish daily forecasts, which would be very useful to soci. Antoine-Laurent de Lavoisier (also Antoine Lavoisier after the French Revolution; French: [ɑ̃twan lɔʁɑ̃ də lavwazje]; 26 August 1743 – 8 May 1794) was a French nobleman and chemist who was central to the 18th-century chemical revolution and who had a large influence on both the history of chemistry and the history of biology. He is widely considered in popular literature as the "father of modern chemistry".It is generally accepted that Lavoisier's great accomplishments in chemistry largely stem from his changing the science from a qualitative to a quantitative one. 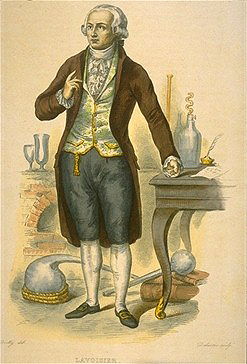 Lavoisier is most noted for his discovery of the role oxygen plays in combustion. He recognized and named oxygen (1778) and hydrogen (1783) and opposed the phlogiston theory. Lavoisier helped construct the metric system, wrote the first extensive list of elements, and helped to reform chemical nomenclature. He predicted the existence of silicon (1787) and was also the first to establish that sulfur was an element (1777) rather than a compound. He discovered that, although matter may change its form or shape, its mass always remains the same.